Floor sanding finishing at the Cruising Club Woodbridge. Sand Skill ltd have recently completed the floor sanding finishing restoration to the maple wood flooring at the Cruising Club Woodbridge. The floor was in bad condition, worn through to bare wood and poorly sanded in the past with a lot of sanding marks. We sanded the floor back to bare wood, level and up to a smooth 120 grit finish. Then one coat of Junckers pre-lack then two coats of Junckers HP commercial. This is a fantastic lacquer, i been using it for about 12 years and never had a problem with. The cruising club is on the sea wall of the river Deben, if your walking along that way please take a look. 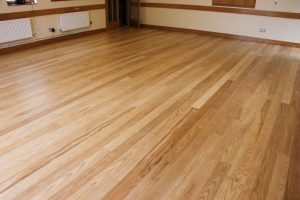 Sand Skill offers floor sanding finishing all over Suffolk and other areas covered include Essex, Norfolk and Cambridgeshire. ← Bays Farm 5 star B&B Forward Green Stowmarket, Suffolk.